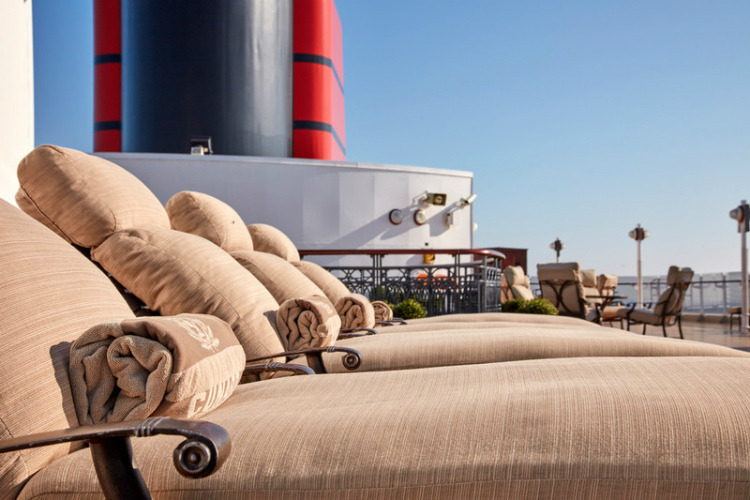 Having been the Cunard flagship for almost 40 years, Queen Elizabeth 2 was a tough act to follow, but the next ship to bear the name Elizabeth offers a glimpse back to the Golden Age of travel. The era of the much adored ship known the world over as QE2 may be gone, but on-board Queen Elizabeth her spirit lives on. Queen Elizabeth – Cunard’s 148th ship – is a model of 21st century cruise ship design which flaunts her aristocratic pedigree with pride. 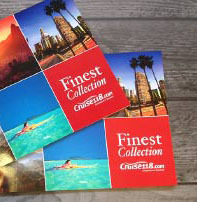 Launched by Her Majesty The Queen in a stirring ceremony in Southampton in 2010, it wasn’t long before this 2,081-passenger ship was stealing the hearts of cruisers who like a more traditional take on cruising. 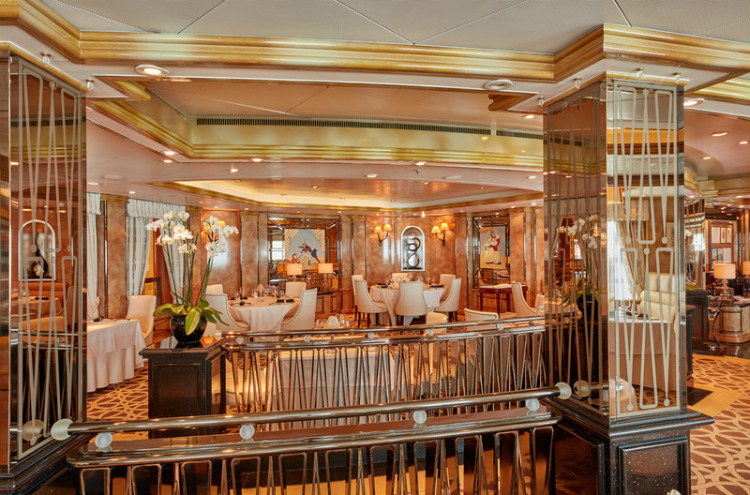 Aboard Queen Elizabeth, glamour is enjoying a renaissance. Guests get their first appreciation of the vessel’s timeless Art Deco design as they enter the Grand Lobby which rises through three decks. This majestic focal hub is dominated by an 18 foot 6 inch-high marquetry panel created by Viscount David Linley which depicts the original R.M.S. Queen Elizabeth. 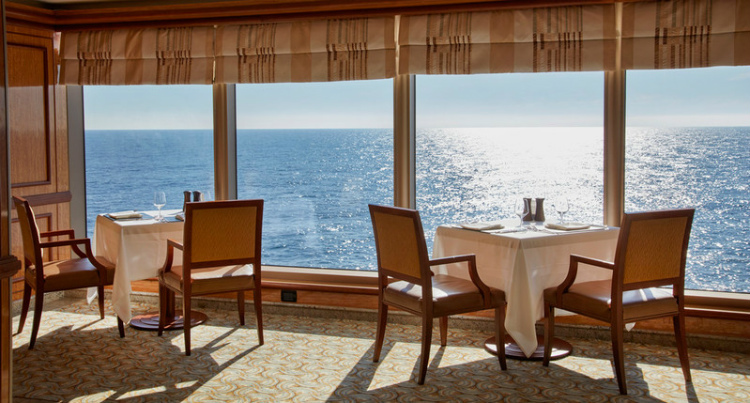 Like other Cunard ships, Queen Elizabeth operates a system in which the cabin grade you choose dictates where you eat. 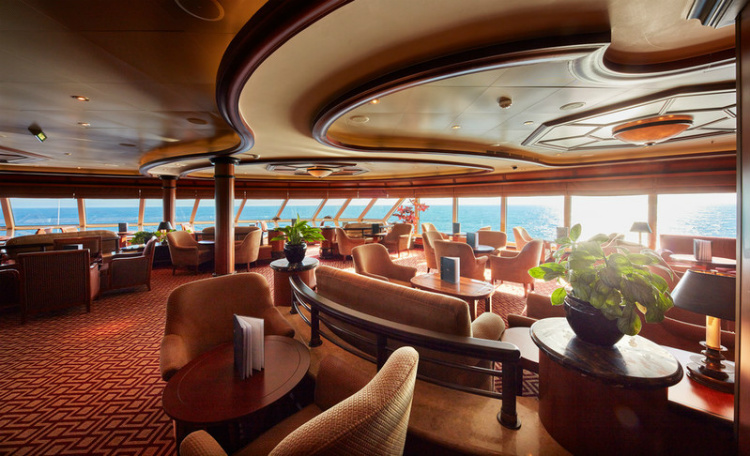 Most passengers dine in the double-height Britannia Restaurant which is connected by a sweeping staircase and is noted for its intimate groupings of tables. The single-seating Britannia Club restaurant – for passengers occupying AA-grade accommodation – has a grand entrance with patterned marble floors and a glass ceiling. For those for whom only the best will do, there is the 132-seat Queens Grill and 120-seat Princess Grill where passengers can savour gourmet dining high up on Deck 11. During the day, the Grills are flooded with light, while by night they are illuminated by chandeliers. Grill guests can also dine in the Courtyard – an alfresco, Tuscan-inspired terrace. The Verandah Restaurant on Deck 2 boasts artwork inspired by the whimsical murals that adorned these eclectic rooms on the former ‘Queens’. At lunch and dinner contemporary and classical French menus create a dining experience that is hard to beat on land or sea (surcharge applies). The recently updated Lido is now more comfortable and the buffet stations are better laid out. Open 24 hours, this eatery is popular at breakfast and lunch where a variety of food stations serve comfort food as well as healthy options. In the evening several speciality dining options for a small surcharge include: Asado for South American cuisine; Aztec, which offers authentic regional Mexican cuisine; while Jasmine boasts Pan-Asian cuisine. For those seeking a more informal dining option for dinner, a buffet station remains open. Afternoon tea is served in the Queens Room by white-gloved waiters and includes freshly baked scones, sandwiches and delicious cakes. True to her Cunard lineage, Queen Elizabeth offers a range of accommodation from the ample to the opulent. In 2015 Queen Elizabeth underwent an extreme makeover which saw more than 3,000 mattresses replaced and the installation of 1,200 flat-screen televisions, not to mention new carpets and soft furnishings giving all accommodation a smarter, more harmonious look. What differentiates them are the draperies, bolsters, accent pillows and upholstery. The Princess Grill suites – similar in layout to mini-suites on P&O Cruises’ Azura and Ventura – enjoy a combination of light wood tones with rich mahogany accents. In the considerably larger Queens Grill suites, the draperies are in a beige stripped fabric with gold tones; the sofas are patterned chenille, while the carpets are teal blue with beige and cream accents. The six Master and Grand suites – named in honour of past Cunard Commodores who received knighthoods – have a bespoke décor and are amongst the most lavish to be found on any passenger ship. 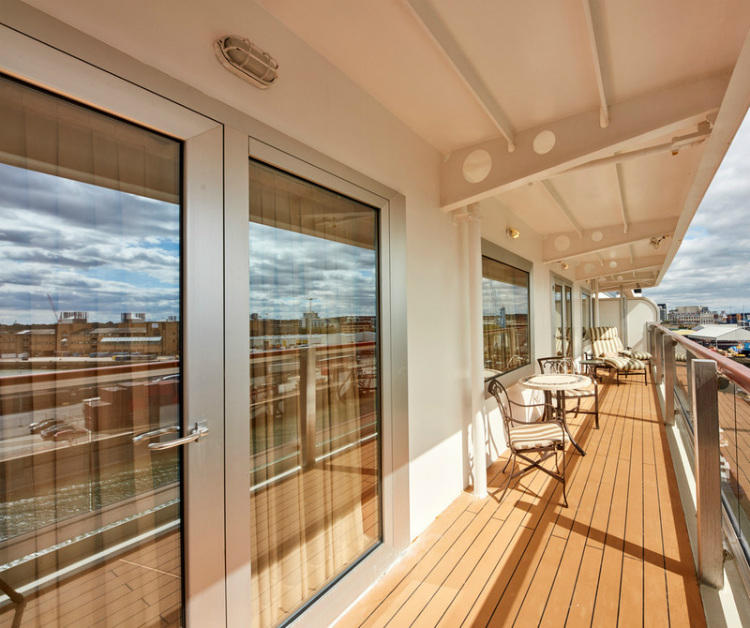 Another enhancement in the refit was the addition of eight single oceanview and one single inside staterooms. Possibly the most iconic space on-board is the Queens Room. Inspired by the Royal Gardens at Hampton Court Palace as well as Balmoral Castle, this two-deck high room is akin to a grand ballroom in a large country house. This room comes into its own during Captain’s receptions: grand black-tie evenings when the Big Band sounds prove popular with the ballroom brigade – a scene that is fast disappearing from many mass-market ships. When it comes to West End-style revues, the Royal Cunard Singers & Dancers can be enjoyed from the privileged vantage point of one of 16 private boxes in the Royal Court Theatre where tiered seating ensures great views. The Commodore Club has a perspective over the ship’s bow, while the nautical atmosphere is enhanced by large murals of former Cunarders. Another watering hole of choice is the Golden Lion Pub which buzzes from morning ‘til night with trivia and music quizzes, karaoke and live sports on the plasma screens. In the Yacht Club sail-inspired, leather-clad vertical columns enhance the nautical accents of this room that transforms into the late-night disco. There is a 6,000-book Library where a spiral staircase to the upper level connects this popular hangout for book-lovers. 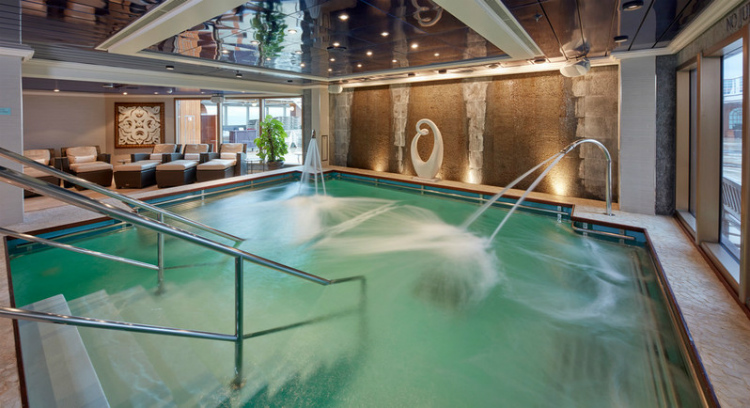 The Royal Spa offers all the usual therapies and treatments to enhance a more relaxed time on-board. In the Royal Bath House, there is a Hydrotherapy Pool and Thermal Suite with therapeutic sauna and steam grotto. As well as a comprehensive gym, there are fitness sessions including yoga and pilates, as well as more energetic ‘Funk Aerobics’ and spinning classes. On deck there is the Lido pool and Pavilion pool as well as whirlpools. Cunard’s roster of high-calibre speakers for the ‘Insights’ programme includes leading academics, authors, politicians and celebrities. On recent cruises aboard Queen Elizabeth these have included Lord Digby Jones; Claire Bloom; Robert Powell and Connie Fisher. The Britannia Club has to be one of the best options on-board for intimate dining without the premium attached to grill-grade accommodation. The accompanying accommodation is looking really smart after the ship’s last bow-to-stern makeover.